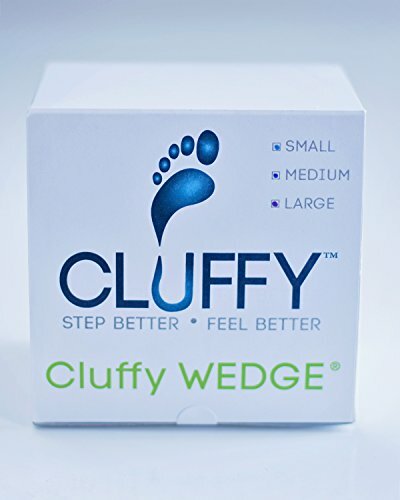 20-pack Cluffy Wedge, (6 pairs small, 10 pairs medium, 4 pairs large) ~ Fits under the big toe, attached to a shoe liner, insole or sandal. Durable, clear gel construction, Made in the USA. Podiatrist designed. Should be applied on all your shoes, insoles and sandals for best results. Non-transferable. Designed to get to the root cause of foot problems and provide long-lasting relief from pain. Heel pain? Fixes the real cause, we recommend attaching this to an insole. Get back to the activities you love to do. Pain behind the small toes on the ball of the foot? This is the BEST product for this condition. Use of this product with arthritis or stiffness of the big toe, is not recommended. If you have any questions about this product by Cluffy,LLC, contact us by completing and submitting the form below. If you are looking for a specif part number, please include it with your message.